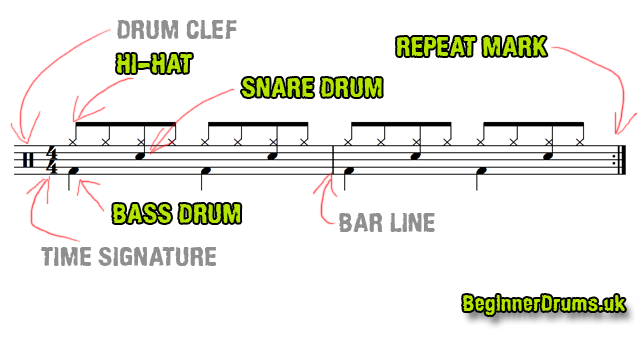 How to read drum music for the drum kit - Beginner Drums guide! Before we start on the basics of reading drum music, being able to read drum notation isn’t mandatory! Plenty of great drummers can’t read drum music at all and play entirely by ear. However, if you don’t know how to read drum music you’re at a serious disadvantage. You’ll be able to practice all the exercises and rhythms on this site! What does drum music look like? Whereas with conventional music each line of music refers to a different pitch. On a drum kit each line refers to a different drum. To start with we’re only going to look at 3 different notes – the hi-hat, the snare drum and the bass drum. The bass drum sits on the bottom line. The stem might point downwards or upwards and the note could be shaded or hollow depending on the length of the note. For more about the different note lengths visit this page. The snare drum sits on the second from top line. Again the stem could point upwards or downwards. The hi-hat sits on top of the top line and is marked with an ‘x’. 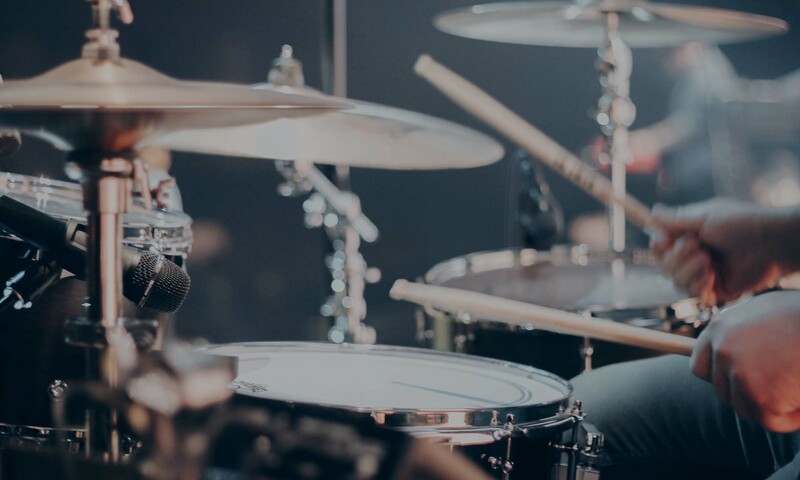 Whenever you see a hi-hat note you’re going to assume you’re hitting the hi-hat with your drum stick (normally using your right hand) while keeping the pedal clamped closed. TOP TIP: In drum music, cymbals are generally identified by a cross or ‘x’ whereas actual drums are identified with a normal looking note. The symbol at the start of the music is known as the clef and it simply informs the reader that this is drum music. The drum clef is either two short vertical lines (most common) or a rectangular box (less common). The time signature simply indicates how many beats there are in a bar and what type of beats they are. So 4/4 in the above example indicates that there are 4 quarter notes in a bar. 3/4 would be 3 quarter notes in a bar and so on. A bar (also known as a measure) is just a simple way of grouping notes together… otherwise you’d just be trying to read a continuous long string of notes. Each bar is separated by a bar line. Let’s play some drum music! If you get stuck have a watch of this video below. Remember this is only a beginner level lesson and covers the very basics of reading music. In later lessons and videos we’ll discuss reading drum music in more depth.